"...between the great empires of the Romans and the Parthians"
He told his slaves to throw the gifts in the river and tear up the letters. "Who is he? And how has he dared to write to his master? If he wants a lighter punishment, let him prostrate himself with his hands in chains. Otherwise I shall destroy him and his people and his land". But it was Odaenathus who scored the victory, forcing Shapur to retreat, and pursuing his army all the way to Ctesiphon. But he couldn't withstand a full-blown Sasanian counter-attack, and it was his turn to withdraw. Palmyra, populated largely by Arab immigrants from the south, had become prosperous under the Seleucids and later under the Romans (the city was nominally part of Roman Syria) by mostly ignoring them, and getting on with business: Odaenathus was appointed governor of Palmyra by the ill-fated Valerian. He invaded Sasanian territory unsuccessfully again with Gallienus, Valerian's son and his replacement as Roman emperor: Shapur tried again to take Palmyra, but failed. 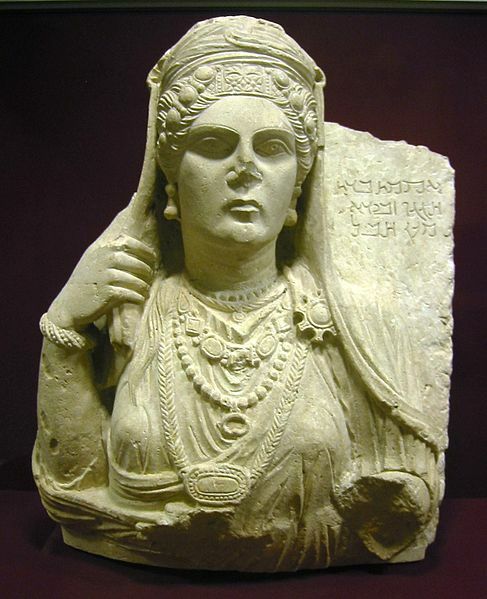 Not Zenobia, but the portrait bust of a woman found at Palmyra. Then in AD 267, Odaenathus was murdered. His wife Zenobia (Zeinab) immediately took charge. 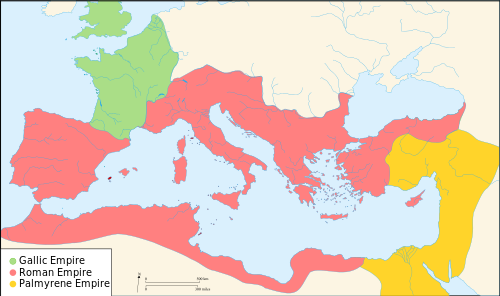 Not only did she, with the help of her generals, make war on Rome, but calmly annexed large chunks of the Roman empire - including Egypt and a substantial part of Anatolia. A Palmyrene empire between Rome and Persia, and a friend to neither, seemed to be emerging. But in Aurelian (AD 270 - 275) Rome had a strong emperor once more. He immediately turned his attention to Palmyra. Queen Zenobia asked the Sasanian king, Shapur's son Bahram I, for help. What should he have done? 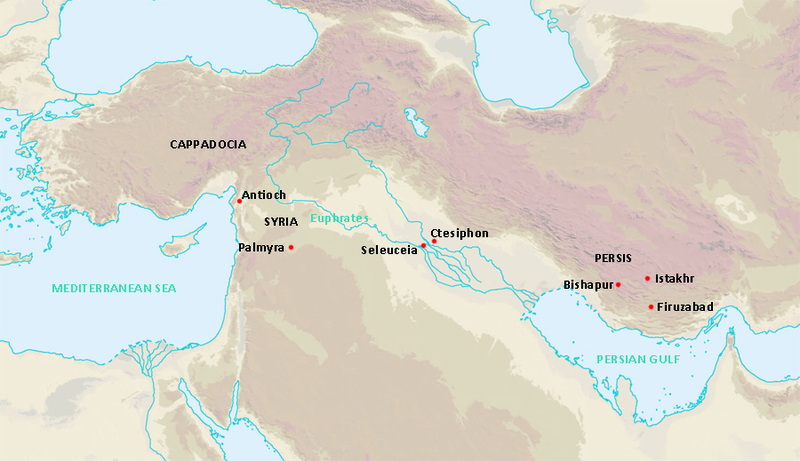 If he'd backed Zenobia with the full strength of the Sasanian army, Palmyra could have become an important power and a buffer between Persia and the Roman empire. Persia would have had a friendly state as a first defence against Rome. But Bahram made the worst possible choice: he said he'd help and did nothing - thus allowing Aurelian to crush Zenobia, and at the same time exposing Persia to danger as a Palmyrene ally. In AD 272 Aurelian sacked Palmyra, and took Zenobia back to Rome as his prisoner in AD 274. After exhibiting her as the bejewelled star attraction of his triumph, he gave her a country house where she lived the life of a sophisticated Roman lady with a Roman husband and children. Luckily Aurelian died in AD 275: he'd been on his way to punish Persia, which was let off the hook. Bahram I died a year later (AD 276) to be succeeded by his son Bahram II ( AD 276 - 293). Nevertheless, Palmyra continued to be a very important link in Mediterranean trade with the east. Goods from India, for example came through Palmyra from the Arab port city of Characene (or Mesene) in the Mesopotamian delta. 2015: As a result of the occupation of Palmyra by Da'esh (ISIS or ISIL), there has been massive and irreparable damage to the remains of the ancient desert city. See article here, and the #NewPalmyra website here. Despite hostility to begin with, the Sasanians have an opportunity to establish a sympathetic power based in Syria between the Roman empire and theirs. But they blow it. Odaenathus was a romanised Arab - Zenobia, his wife, claimed descent from Cleopatra of Egypt and, for good measure, from Dido, Queen of Carthage. According to a 6th century Greek official Petrus Patricius.